Antarctica and the Southern Ocean exert immense influence on global and regional climate systems. Physical, chemical and biological changes to Antarctica and the Southern Ocean will impact Australians with respect to sea level on coastal communities, weather patterns (including rainfall patterns and extreme events) and the health of the marine environment. The greatest uncertainty in estimates of future sea level rise is the response of the Antarctic ice shelves to the warming of the surrounding oceans. 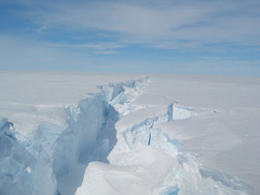 Increased melt at the base of the fringing ice shelves results in more rapid mass loss from the Antarctic Ice Sheet and faster sea level rise. However, the processes regulating melting of ice shelves are poorly known and projections of future sea level rise are therefore uncertain. Satellite data suggest that parts of the ice sheet are experiencing rapid change at the margins and the fringing ice shelves. The dramatic collapse of some West Antarctic ice shelves and the significant predicted reductions in sea ice extent and surface area over the next century in Antarctic waters emphasise the pressing need to better understand ocean-ice system dynamics. Current understanding is limited by discontinuous measurements of both ice (sea ice, ice shelf and ice sheet) properties and sub-surface conditions and currents, and their influence on marine ecosystems. The Antarctic continent (or solid Earth) and cryosphere (the frozen water part of the Earth system) are a tightly coupled system with complex inter-dependencies. 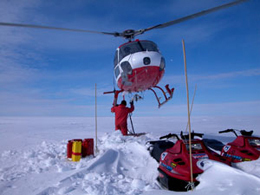 Science can only understand the state of the present-day ice sheet, and its future evolution, by understanding the interplay of ice sheet history and solid Earth properties to depths of hundreds of kilometres. Knowing the past history of ice sheets is important in resolving the current estimates of cryosphere contributions to sea level. Basic information about the geometry of the sub-ice-shelf cavities and continental shelf bathymetry, the state of the oceans, ice shelves and ice sheet surface melting is currently insufficient to reliably inform numerical ice shelf-ocean models. Beneath the ice in the polar marine environment, microbes play pivotal roles in the ecology and biogeochemistry of Antarctic sea ice and the Southern Ocean. Microbes drive the biogeochemical cycles of carbon and other nutrients, the production and removal of greenhouse gases, and are the base of the polar ecosystems that support life from krill to apex predators. Mesopelagic organisms living below 200 metres link the lower and upper parts of the foodwebs and connect the upper ocean to the abyssal plains on the seafloor. 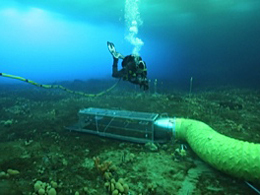 Little is known about what controls the distributions or make-up of the communities that comprise either microbial or mesopelagic components of foodwebs, and hence how their structure and function will alter with projected future changes to both the cryosphere and ocean. 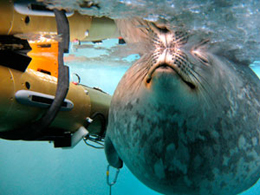 Supporting all of the above will be the development of polar-capable autonomous underwater vehicles, improved sensors for polar sampling, and near real-time sea ice charting and forecasting information for polar vessels. Advancing our understanding of how the oceans melt Antarctic ice shelves, and quantifying present and future Antarctic Ice Sheet mass loss and its contribution to sea-level rise. Building our understanding of environmental controls on marine life, ranging from pelagic microbes to benthic communities using various sampling platforms, lab-based microbial culture experiments, habitat and life history assessments of mesopelagics, and regional process studies. Assessing the contribution of the Antarctic Ice Sheet to sea level since the Last Glacial Maximum (~20,000 years ago) via geophysical observations and modelling. Developing an innovative, next-generation, polar AUV to acquire high resolution data under sea ice and ice shelves; providing a near real time sea ice charting service to vessels operating in the East Antarctic; and conducting research to support sea ice forecasting.